Uber Cup defending champions China emerged on top of Group D after beating Indonesia 3-2 in their final group assignment at the TOTAL BWF Thomas & Uber Cup Finals 2018 today in Bangkok. Despite the loss, Indonesia had much to cheer about. After trailing 0-2, with Fitriani Fitriani falling to Chen Yufei in the opening singles and Greysia Polii/Apriyani Rahayu to Chen Qingchen/Jia Yifan in the doubles, Gregoria Mariska Tunjung came to her team’s rescue. 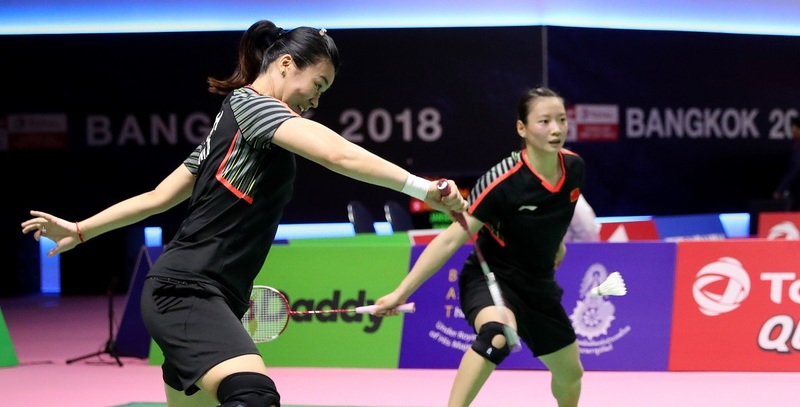 The World Junior champion, winner of both her previous matches in the group, was stubborn in the face of pressure from Gao Fangjie, eking out a close first game win before cruising ahead in the second, 23-21 21-16, to help her team stay alive in the contest. That hope was snuffed out in the fourth match, with Huang Dongping/Tang Jinhua (featured image) elbowing aside Rizki Amelia Pradipta/Della Destiara Haris, 21-16 21-16, but Indonesia weren’t done yet despite losing the tie. Ruselli Hartawan took on Li Xuerui in the fifth match, and like Mariska, showed great temperament against her higher-rated rival. The Indonesian stayed in the rallies and pushed Li into making errors; the former Olympic champion from China has only recently returned to competitive badminton and the rustiness showed, for she made a number of errors late in the match, enabling Hartawan to pick the second point for Indonesia. In another tie of the same group, Malaysia trounced France 5-0 to finish third, behind China and Indonesia. The closest France came to taking a point was in the fourth match – Lea Palermo and Delphine Delrue had things going their way with a 17-12 lead in the third game against Vivian Hoo/Tee Jing Yi. The Malaysians picked off five points in a row and it was a neck-and-neck battle from then on, with the French having two match points and the Malaysians five. Eventually, Hoo and Tee converted on their sixth opportunity to keep the slate clean for Malaysia, 21-13 15-21 28-26. Kisona Selvaduray outplayed Katia Normand 17-21 21-14 21-9 in the last match to see Malaysia through to a 5-0 result. Thomas Cup Group C was reckoned to be the ‘group of death’ before the competition started and so it proved to be, with the two remaining ties also seeing exciting finishes. In the contest for the top spot in the group, Japan overcame Chinese Taipei 5-0, but the first two matches were won by narrow margins, and the score could well have been different if Chinese Taipei had taken their chances. Chou Tien Chen came out guns blazing against Kento Momota and it was a lively battle until late in the third game, when the Japanese exerted his iron control over the rallies. Takeshi Kamura and Keigo Sonoda were also engaged in a high-intensity battle in the first doubles with Lee Jhe-Huei and Lee Yang, who were edged out 23-25 21-19 21-16. Wang Tzu Wei too narrowly faltered against Kenta Nishimoto, 21-18 21-17, and then the fight went out of Chinese Taipei, with Wang Chi-Lin/Yang Po Han and Yang Chih Chieh both falling in straight games to Hiroyuki Endo/Yuta Watanabe and Kanta Tsuneyama respectively. In the battle for third place, Hong Kong survived a spirited challenge from Germany. Germany won both doubles to equalise deficits in the singles, and it was finally between German veteran Marc Zwiebler and Lee Cheuk Yiu. The younger Lee prevailed in an hour-long battle, 21-13 15-21 21-15 giving Hong Kong a 3-2 victory.